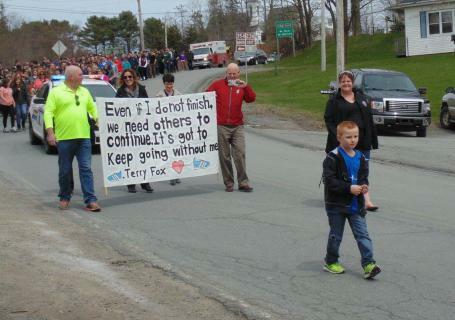 In late April, Fred Fox, Terry Fox’s older brother, visited Kennetcook District Elementary and Hants North Rural High. Over 400 students and staff joined Fred in a walk through the village of Kennetcook to help further Terry’s dream of raising awareness and raising money for cancer research. Fred was also presented with a cheque of over $400, one dollar for every student. Grade 2 student, Cody, is one of the reasons Fred chose to visit KDS. Cody has a strong interest in Terry’s story. Mrs. Hingley, a teacher at the school, was in contact with Mr Fox and when he heard about Cody collecting recyclables to raise money for the foundation he was very moved, and made KDS a stop on his Maritime visit. Fred gave an emotional presentation to the student body, after which he was presented with the cheque from the school and Cody’s money raised from his recyclables.